Gino Weinberg is the Knight of Three, a seventeen-year-old ace pilot of noble descent. Gino comes from a very rich upbringing, and as such doesn't quite understand how the real world works. However, his cheerfulness and friendly demeanor earn him many friends. 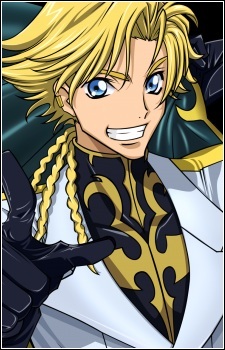 He takes an immediate liking to Suzaku upon his appointment to the Knights of Rounds. He pilots the transformable Knightmare Frame Tristan. Gino is impressed when Kallen defeats both him and Anya in her upgraded Guren Flight-Enabled Version, remarking that her skill is on the level of a member of the Knights of Rounds. He also expresses disappointment at not getting a rematch when she is captured by Li Xingke. He enrolls in Ashford Academy with Anya to learn what it's like to live as a regular person. During Kallen's imprisonment in Tokyo, Gino visits her and asks if she has any intention coming back to Brittannia under the name of Stadtfeld. The attack on the settlement interrupts their conversation, but he gets his answer when she is set free and joins the battle. She confirms for him that she has chosen the name of Kōzuki, and when asked whether them meeting on the battlefied is a reason to be happy or sad, he claims that they should enjoy it. He then asks Suzaku to let him deal with Kallen himself, but Suzaku insists that she would not let him off so easily and stays to fight her. Code Geass tells the tragic story of an oppressed Japan under corrupt Britannian rulers. Despite dealing with heavy themes involving war, there are moments in the show that we just have to laugh at. So take a break from the solemnity and enjoy the 10 funniest moments in Code Geass!